Homemade sensors can be connected to the inputs of the PIC microcontroller circuit. 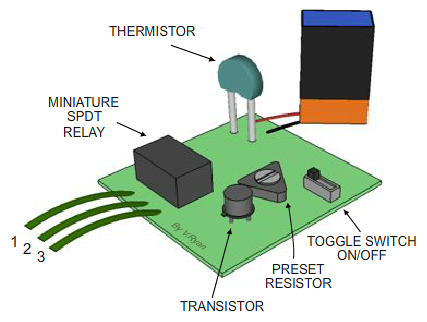 The drawing below shows a homemade temperature sensor being used, as an input to the microcontroller circuit. It has been connected to INPUT A/D 0. When the genie microcontroller circuit is programmed, the sensor becomes a type of switch. The temperature sensor can be used to trigger OUTPUTs, such as LEDs or motors. Homemade temperature sensors normally have three wires, that connect to the INPUTS on the microcontroller circuit. Opposite. is a simple temperature sensor. The most important component is the thermistor (click here for more information on thermistors). This temperature circuit, can be connected as an input to a microcontroller circuit. The temperature sensing circuit has three green wires (1, 2 and 3). Wire 2 should always be connected to one set of the inputs. If wire 1 is also connected then the sensor energises the relay, as the temperature rises . If wires 2 and 3 are connected to the inputs, then sensor energises the relay, as the temperature falls. 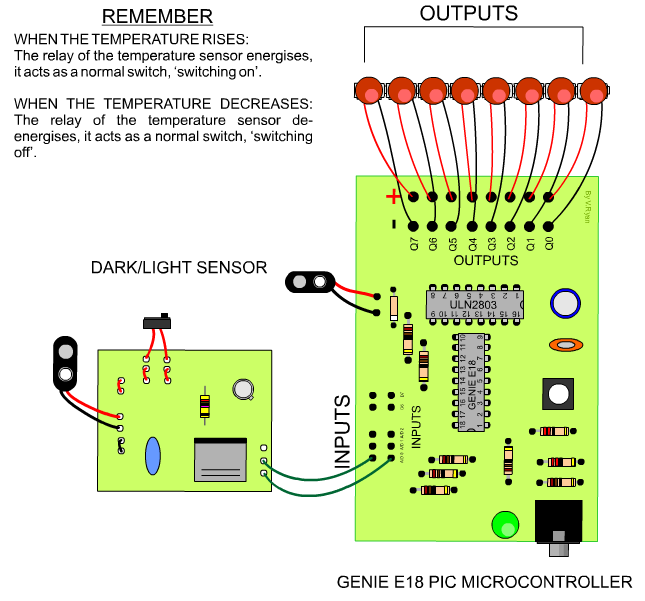 The diagram below, shows the temperature sensor, connected to the GENIE E18 PIC Microcontroller’s inputs. This microcontroller has five inputs and the sensor is connected to A/D 0, although it could be connected to any input. When the relay of a temperature sensor, connected to an input, de-energises, the microcontroller turns on a warning LED. The LED remains on until the temperature rises, energising the relay again. This could have a simple but effective practical application. If the PIC microcontroller and temperature sensor is placed on the outside of a car, when the temperature decreases too far, a warning light illuminates. This warns the driver of the possibility of ice. Alternatively: If the sensor and PIC microcontroller is placed in a baby’s bedroom, when the temperature rises too high, a air conditioning unit could automatically turn on, cooling down the room to a safe temperature.